Solar Stocks: Rain or Shine? Solar stocks have skyrocketed in the past year thanks to rising oil prices, but that doesn’t necessarily mean that if oil continues to drop that they will, too. No, solar is an industry that is on the rise with increasing sales orders to prove it. As a matter of fact, just yesterday LDK Solar (LDK), a Chinese manufacturer of polysilicon-based solar wafers, said that wafer production is ahead of schedule and raised 2009 sales estimates well above Wall Street expectations. The news cheered investors who watched their stock increase over 9% breaking out of a three month base on heavier than normal volume. It also gave a lift to an otherwise sagging sector with Ascent Solar (ASTI) and Akeena Solar (AKNS)–two stocks that have been particularly beaten up in recent months–rising the most (3% and 4.3% respectively). Today, however, tells a different story with solar sliding as oil rises leading us to ponder the following question: Is the recent good news a harbinger for another growth spurt in the solar sector or will declining oil prices weigh them down? The answer is that it’s not easy to tell since most of the companies in this space have only been publically traded for two years, if that. Even Larsen Kusick, a scribe at TheStreet.com, admits that it’s unclear which fundamental statistics will provide long-term guidelines for future profit estimates. He selects five solar stocks that look the most “interesting” (he doesn’t define that term in his article) and divides them into two groups based on the underlying sunlight-to-electricity conversion technology. First Solar (FSLR) and Energy Conversion Devices (ENER) use thin-film technology as their conversion mechanism. The other group uses polysilicon-based technologies–a more efficient conversion mechanism than thin-film but also in short supply. The companies dependent on polysilicon are SunTech Power (STP) and SunPower (SPWR), a division of Cypress Semiconductor (CY). (Check out their charts–they’re virtually identical.) Trina Solar is the last stock. It, too, relies on polysilicon but one stand-out feature of its business model is that it is vertically integrated, using polysilicon that it recycles from the semiconductor industry. From the standpoint of revenues, First Solar and Trina lead the pack. Both have experienced impressive growth over the past year (although First Solar’s first quarter sales were down compared with last year’s) and are expected to increase or at least maintain this high level through next year. Kusick is a little worried that these future expectations might already be built into the stock prices, and he might be right. The weekly chart of Trina shows it’s been caught in a downward channel since it hit its $72 high last summer. It’s the biggest loser in the space today posting a 9% loss as of this writing. A tug of war seems to be going on in First Solar as the stock has been channeling between $250 and $300 for the past several months. It needs to break above its previous high of $317 for this chart to have any legs. Wall Street has had to play catchup with Energy Conversion. Recent quarter estimates blew out analyst expectations resulting in further overextension in price. Since January, the stock has risen from $22 and is now bouncing off of $80 resistance–an increase of over 260%. Usually, when a stock rises this high this fast, a breather is in order. Unless it blows out earnings again, I’m expecting it’ll have difficulty breaking through this upper resistance level. Looking at other fundamentals, Kusick found that P/E ratios painted a better picture than Price/Sales, but here again the results are subject to some confusion. SunPower and SunTech have cheaper valuations but remember their profits are closely tied to the supply of polysilicon. Of the entire group, Trina sports the lowest P/E. Kusick’s reasoning is that Wall Street isn’t sure if the company’s vertical integration model will stand the test of time. Generally, First Solar is considered the 400 pound gorilla in this space, but I’d be a little gun-shy of marrying into that company since insider trading as of late has been extremely heavy. What about other names in this space? Although these companies may be fundamentally confusing and technically uncompelling, that doesn’t mean the rain won’t let up at some point. The problem with any new technology is that there’s a rush of startup companies–some will make it, some will fall by the wayside, and the rest will be gobbled up by the larger fish in the sea. I think that’s what will happen to solar over the next few years, and many of the names we see today will have disappeared by one means or another. So which ones will survive? Right now, that’s almost anybody’s guess. But don’t worry. Once the clouds clear the sun will shine and it’ll be evident which companies are here to stay. For now, I’ll stay on the solar sidelines and roll my die in other sectors. If you ever tune into CNBC’s Fast Money show, you may have heard one of the Najarian brothers cite unusual options activity happening in a particular stock, but many of you out there may not be aware of the implications of this observation. Generally, when something big is about to happen that will significantly affect a company’s stock price, many greedy insiders will buy options before the market-moving event is announced. Why don’t they just buy the stock? For a couple of reasons. First of all, trading on inside information is illegal and buying stock is tantamount to signing a confession. Everyone knows who bought what and when they bought it. But it’s a lot easier to cloak your identity in the options market where market activity isn’t actively monitored. The other big plus is the increased leverage that options have over stocks. Why make a little money when you can make big money? Insider trading is illegal and people who are caught face time in the hoosegow. Just ask Martha Stewart. The fact that it’s illegal doesn’t stop many people from doing it, and one way they tip their hand that something’s up with the underlying company is by a significant increase in options volume as well as open interest. (Open interest is just the number of contracts that aren’t yet closed out.) Although the Najarians tend to only look at volume, to me it makes more sense to look at the increase (or decrease) in open interest. A spike in volume doesn’t necessarily mean a corresponding increase in open interest. Also, a change in an option’s implied volatility might also be a telling factor. 6. Significant company news, such as CEO departure, SEC investigations, etc. Why am I bringing this up? Because for years I’ve been jonesing to do some research on this subject, so basically I’m just making the announcement that I’ll be doing as such over the next few weeks (or as long as it takes.). When I have some results, naturally I’ll let you know. Even if you’re not a member of the “smart money” set, you’ll be able to profit right along with them, and do it legally, too. And isn’t that a whole lot better? I’m heading out to the beach to hang ten. (Hang ten for me means taking a brief snooze.) Have a lovely weekend! Since my February 13th blog where we looked at the retail sector, it seems like girls just wanna do something other than open up their Prada bags in the department stores. Previously, I mentioned that independent analyst Dana Telsey thought that retail was due for a rebound especially since many of the stocks were 26% off their yearly highs–her major criterion for a sector bull market. So, did retail measure up to her prediction? Buckle (BKE): Up 25% since 2/13. The stock has been trading between $44 and $52 since March (it’s been a great channeling stock!) and I’d either add to current positions on a decisive break above its upper channel or lighten up on a break below its lower one. Aeropostale (ARO): Up over 20%. It too recently put in a new all-time high and still sports a bullish chart. Wal-Mart (WMT): Up 16%. Overall, the stock is advancing but it’s been caught in a trading range for the past few months. If you own the stock, writing covered calls could be a good strategy to generate a little extra income. Note that the company pays a dividend (currently 2%). Gymboree (GYMB): The stock was up 17% before succumbing to the early June sell-off. The stock is trading right at support and I can’t say whether or not that level will hold. I wouldn’t be a buyer (or a seller) until I get some sort of definitive confirmation. Stocks breaking out of bases didn’t fare nearly as well. Many of the stocks rode the escalator into the basement. Jones Apparel (JNY) was the only stock that held onto the hand-rail. The take-away lesson here is that stocks making new highs fared significantly better than those breaking out of bases. Are there any bargains out there? Most of the retailers have been singing the summertime blues (and there ain’t no cure for them), especially the mid to high-end department stores. (Look at the charts of Saks (SKS), Coach (COH), Nordstrom (JWN), Macy’s (M), and Gottschalks (GOT) and you’ll see what I’m talking about.) To add to current woes, teen apparel manufacturer and retailer Hot Topic (HOTT) today reported disappointing same-store sales and said that back-to-school trends have been weak so far. These sentiments echoed Ms. Telsey’s comments made on CNBC yesterday who said that back-to-school sales have been dismal so far but there’s a chance sales may pick up at the last minute. She also expects the Grinch to steal some Christmas cheer with shoppers reducing their holiday spending. So, is there anything out there worth buying? If you do elect to buy retail, I would advise you not to put all of your purchases in one shopping basket, as some of them could just be passing fads, like flowered shirts and bell-bottom pants. Oh, wait, aren’t they back in style? *Jim Cramer picked Lululemon near the stock’s peak last year. I’ve found that whenever Cramer picks a niche-type stock (and he usually does it when the stock has already made a huge run up), it’ll go up for a short time most likely due to the Cramer effect, then it’ll reverse sharply and drop faster Paris Hilton’s skivvies. In fact, one could make beaucoup bucks by shorting them. A couple of other Cramer clunkers have been Zumiez (ZUMZ) and Jones Soda (JSDA). Check out those stinky charts–eeeew! On July 18, I began the MANDA Fund which employed the simple strategy of buying stock in the acquiree on the day of the takeover announcement. The fund (click on Portfolios under Blog Resources) currently consists of four holdings. Although there have been other takeovers announced during this time, only those four made the cut…so far. But I do have some takeover candidates on the radar screen and if their prices drop enough for the returns to become attractive, I’ll buy them on the condition that their deal is still on track. If you’re a home gamer–Cramer-speak for you folks who want to build your own M&A portfolio, here’s some tips for you to (hopefully!) make better choices, and if you want to become a home-gamer, look at Recipe #13: Post-Takeover Tacos for instructions. 1. Buy stocks in cash-only deals. That isn’t to say that you should shun deals involving cash plus a percentage of the acquiring company’s stock completely, but be aware that if you buy in too early, you risk the possibility of a stock drop. Take Teva’s (TEVA) bid for Barr (BRL) which was announced on July 18th. The offer is for $39.90 in cash plus 0.6272 shares of Teva priced at the close of the deal. You could buy Barr today for $67.74, but what if Teva’s stock drops between now and merger close? One missed earnings estimate could send it plunging and you’d be waving bye-bye to your profits. The thing to do is to put both stocks on your radar screen and start monitoring the news and price movement about a month or so before the deal is expected to close. If the market looks bullish, Teva’s price is advancing, and a decent return on Barr can be made, then by all means take a chance and buy some. 2. Don’t buy stocks that are trading above the offering price. I know this sounds like a no-brainer, but look at Imclone (IMCL). Bristol-Myers (BMY) made an offer for the company on July 31st for $60/share. Since then, Imclone has been trading at a $4 premium as many company insiders including Carl Icahn, Imclone’s maverick Chairman, feel that the company is substantially undervalued. But if the Microsoft/Yahoo! deal can fall through, so can this one. And who’s to say that Bristol-Myers will raise the ante or that another suitor is waiting in the wings with a better offer? What with my crystal ball in the shop, this deal is just too risky for me. 3. Be careful of contingency deals. Those are the ones like the recent APP Pharmaceutical (APPX)/Fresenius SE (FMS) deal where FMS agreed to pay $23/share for APP plus as much as a $6 premium if certain financial milestones are met. The contingency amount will not be made until the second quarter of 2011, three years from now! I don’t know about you, but I’m not interested in waiting around until then especially since there are no guarantees that the milestones will be met. 4. Read the news on both the acquirer and the acquiree. If there’s any potential sticking points–hostile takeovers and regulatory concerns spring to mind–then it’s best to hold off. Look how long it took the XM/Sirius merger to clear their anti-trust issues. 5. Check to see if the acquiree will be posting dividends before the deal closes. This will not only affect the current price of the stock but also your expected returns. 6. Do the math. Make sure that you’ll be getting a decent rate of return. This is another no-brainer but one that some may overlook. If you estimate a 4% return on the deal but it’s not expected to close for a year, this is not a great trade. You could probably do better putting your dough in a CD or a treasury. That’s about it for now. M&A activity has been understandably slow what with vacations, the Olympics, and the anemic market, but I expect it to pick up once the Wall Street honchos return to their corner offices. Dollars and Sense: Should you dump your foreign investments? There’s been a lot of media musing about the state of the greenback: Have we finally hit bottom or is there more downside still to come? The chart of the UUP (the US Dollar ETF) shows that it sure seems to be rebounding despite being down today. If the price can make it through $24 resistance, it’s reasonable to expect further strengthening. The dollar is sensitive to commodities–gold and oil in particular–as well as to interest rates. The dollar reacts inversely to commodities, so if commodities rise, the dollar falls, and vice versa. Rising short term interest rates tend to be good for the greenback since it attracts foreign investors to US markets. (Since US equities and treasuries are dollar-denominated, foreign investors must convert their currency into the greenback in order to buy them.) But the reverse is also true: A US investor can lose money on those foreign investments based on currencies that are falling with respect to the greenback, even if those assets are appreciating. Why? Because eventually the assets will be sold and the proceeds converted back into dollars. Depending on the exchange rate, the investor can end up with a much smaller than expected profit or even a loss! Okay. I have some foreign holdings–what should I do? Buy: There isn’t one country ETF in the world that I would buy right now. The markets that are currently underperforming the least are the US (although the recent rally may be short-lived as evidenced by topping tails on the weekly charts) and our south of the border amigo, Mexico. Many of these ETFs have their short and double-short counterparts, but I wouldn’t be too hasty to jump into them as most have risen substantially in a short period of time. For right now, sitting on the sidelines isn’t such a bad idea especially if you’d rather be watching the Olympics than the market. Just before the Fed interest rate decision was issued last Tuesday, I put on a virtual OTM (Aug132 call/Aug122 put) straddle on the SPY for a net credit of $0.71/contract. I closed out the call side the same day for a net credit of $0.13/contract and held onto the put side since I felt the trade would be profitable (or almost breakeven) in the next day or so. Two days later, the market did indeed take the predicted breather, but I chose to hold the puts for another day on the assumption (based on market indicators) that a better price would be had at Friday’s open. Alas! This was not to be the case as the market shot straight out of the box, never looking back taking my profits along with it. I was in a dilemma: Should I close out the puts at the closing price of 9 cents/contract and accept a 22 cent loss on the spread, or should I wait it out for a few more days and hope for a huge market decline? There are three emotions that act as stumbling blocks on the road to trading profits–fear, greed, and hope. I read a study that named fear as the number one emotion that trips up traders. Many traders have low risk tolerance (read: fear) which forces them to exit trades before they have a chance to become profitable. Greed is the number two factor and it acts to either force traders into taking profits too quickly or to ignore price collapses thus watching profits fade away. The last part of greed is usually taken over by hope–hope that somehow the winds of fortune will blow again in their favor. All three of these factors formed the mass zeitgeist of the tech bubble. Let me illustrate with a true story. Bobby is a friend of mine who loaded up on a bunch of tech names in the late 1990’s, midway into the tech boom. His profits were catapulting into the stratosphere along with everyone else’s until the summer of 2000 when the bubble finally burst. Looking at the failing charts that represented his holdings, I told him he should get out completely or at least lighten up. But would he would hear of it? Uh-uhn. A zombie to greed and to the pervailing belief that the market could never fail (remember the Dow 50,000 hysteria?) he flat out told me he’d never part with any of his pet stocks. Ever. Of course, most of you are familiar with the rest of the story. Not only did Bobby lose all of his substantial profits, but he finally exited his positions at an uncomfortable loss. He even went so far as to watch some of his tech darlings go belly-up. So disgusted was he with the stock market (it was the market’s fault, not his!) that he vowed never to buy another stock again, and to my knowledge, he hasn’t. By letting fear cloud his perspective, he missed out on the 2003 bull market in energy and commodities. Greed, hope, and fear…in that order. Most folks pretty much know which of the three emotional horsemen steers them in the wrong direction. If you keep a trading journal, you’ll quickly find out which is your nemesis. My downfall is that one emotion that Pandora didn’t let escape from her magic box–hope. Don’t get me wrong. Hope is indeed the savior of the human condition, but it is the enemy to profits. And it tripped me up, big-time, in this trade. I knew that I should have gotten out of it after at most one day, and if that meant taking a loss, then so be it. It’ll be recorded in my trading journal, and after analyzing what went wrong, I’ll vow never to make the same mistake again. (Or at least two more times. Let’s be real here.) I mean, to even break even on the put side of the straddle would have required a large drop in the index, an unreal expectation given that the market is in a definite uptrend. I finally faced facts this Wednesday and exited the put side at 6 cents/contract giving a total loss in the trade of 25 cents/contract. Good thing I didn’t risk any real money! But we can learn a lot even from a failing paper trade–in fact, it’s from my failures that I tend to learn the most valuable lessons. 1. I learned that thinking through the trade first is worth it, even if it requires a little backtesting. Yes, thought and research take time, but paradoxically I found it saves more time in the long-run, not to mention frustration. If the method is unprofitable or too risky, why paper trade it in the first place? I’d rather put my time to better use researching safer strategies with greater profit potential. 2. Paper trading a new strategy is essential. I know I keep harping on this point, and as you can see from the failure of my straddle trade, it can’t be emphasized enough. 3. I learned that out of the three emotions that cripple traders–fear, hope, and greed–hope is still my downfall. Although I did have good technical reasons for holding onto the put position, I knew that holding onto OTM expiring options for more than a hot minute is foolish as time decay is my biggest enemy, and if I had even thought about it for more than five seconds, I wouldn’t have even considered putting on the trade…but I wouldn’t have had a chance to write this blog, either. At least something positive came of it! 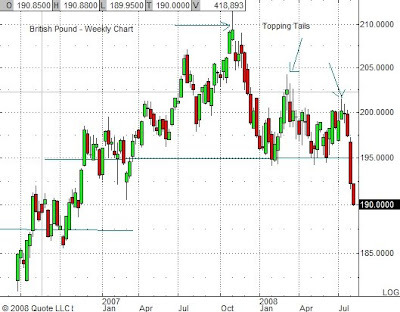 …or why short the British Pound? A quick jump into market waters during my summer break to give you the heads up on the state of the British pound and why many pundits think it’s a compelling short play. 1. Goldman Sachs (GS) recommended shorting the pound last December. 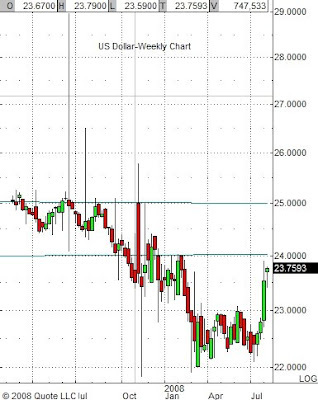 This was after the it peaked in October (see weekly FXB chart below). Breaking $204 support in December was all one needed to be convinced this currency was heading down down down. 2. Lehman (LEH) cited seven reasons to hate the quid. The general consensus among the major financial institutions is that shorting the pound is THE trade of the year. 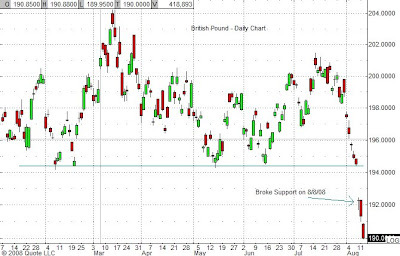 Look at both the daily and weekly charts of the FXB, the ETF that tracks the British pound, and you’ll see that major support at $194.50 was broken convincingly last Friday (8/8/08). Since then, it’s traded down to its $187 minor support level. Goldman recently issued a statement saying that they see further downside to at least $164 which is 12% below its current level. Why not just buy the US Dollar? In summary, fading the pound might help keep you in the (fish ‘n’) chips. Note: Some of these pay a nice dividend. Friday Roundup & Another Late Summer Rally? Refreshed after a lovely birthday spent at the beach and retail window-shopping, I’m back for a quick check-in with the market and my positions. Tumbleweed Communications (TMWD) announced today that its shareholders approved their merger with Axway, Inc., a subsidiary of Sopra Group S.A. The merger was announced June 5th with a cash offering of $2.70 per share of Tumbleweed. The deal is expected to close in the third quarter and is still subject to some regulatory approvals. I picked up the stock today at $2.52/share. The expected yield on the transaction is 7% giving an annual return in the 40-50% range, assuming the deal closes near the end of September. Just before the Fed released its decision on interest rates this past Tuesday, I put on a hypothetical out-of-the-money (OTM) straddle on the SPY, buying the Aug132 Call for $0.27 and the Aug122 Put for $0.44. (I’ve done this before with at-the-money (ATM) straddles but wanted to see how it would play out with an OTM one.) I exited the call side at the close for a 13 cent gain. Yesterday, the market tanked and I was hoping to at least break even on the put side, but that was not to be. I would have closed it out at near the end of the trading session, but the market internals were indicating a continuation in downward momentum and so I held my position, hoping at least for a continued slide through today’s opening. Alas, that was not to be what with crude taking a $3 dip. Since the put has very little time premium left, I’ll hold it for another day or two. This may be a grave mistake since there’s been a late summer rally every year since 2002 and the way this market is looking, I would expect the same for 2008. Why the late summer rally? I think the reason for late summer rallies is the same underlying mechanism as for holidays–people are on vacation and in a good mood. August is traditionally the time of year that the Wall Street Masters of the Universe head for the Hampton’s leaving the less experienced smaller dogs in charge. If you look at the chart of the SPY you’ll see that trading volume dries up between the middle of August and the middle of September meaning that institutions aren’t contributing their fair share. This leaves the rest of the world–the Wall Street mutts and the retail investor (i.e. the average joe) in control. And with the price of oil falling hard and fast, it’s no wonder that the average joe is happy, and it’s my thesis that that exuberance is the main factor contributing to the buying pressure. So, on the basis of history and the fact that oil is tanking, I do believe we’ll see another late summer rally heading into the middle of September. A good short-term play would be to buy long-term calls or call spreads on the index tracking stocks (SPY, DIA, QQQQ) or just the shares themselves for you more conservative folks. But watch out when the Masters of the Universe return, for the market just could make an abrupt about-face. Tomorrow is my birthday so I’m giving this vacation as a present to myself. Happy Birthday to me! *Professor Pat contributed ten blogs to the cause for which I’m very grateful. You are currently browsing the Stock Market Cook Book blog archives for August, 2008.